To speak of Christ as glorious is to speak of his reputation, fame and honour. It is a term of exaltation, revelation and eschatological salvation. This idea is probably related to this area of the term’s meaning for, James clearly thinks about the exalted Christ and his return to judge. 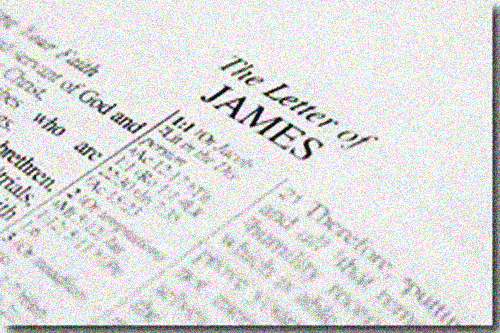 Thus for James, those who hold the “faith in our glorious Lord” with partiality are not debasing just any belief, but rather a faith-commitment in the one exalted Lord Jesus whose glory will be fully revealed in eschatological judgement. The statement of principle (1:1) that the example will illustrate (1:2-7) suddenly refers to the Lord Jesus as the basis for the faith that readers are to put into practice. Then the term prosōpolēmpsia (“partiality”) is rare in non-Christian writings. It may have been formulated in early Christian circles. It commonly refers to God’s evaluation of human beings. Status and accomplishments in this world will not change the individual’s standing before God. The terms also functions as a Christian neologism, based on the Hebrew naśapanîm, which can be translated literally as: “to lift up the face/appearance” and similarly in the sense of “respecting persons” or showing favouritism. This idiomatic expression in the Old Testament had the sense of “respect of persons,” with the connotation of improper partiality. We note for example Leviticus 19:15: “you shall not be partial to the poor or defer to the great.” Interestingly, all these passages deal with partiality to the poor in the context of a judicial setting, putting forward an axiom: God shows no partiality (Dt. 10:17), so neither should human judges. James employs two stylistic devices to emphasize his argument. The first is a syntactical device: “in partiality” stands empathically after the negative me. The second is that he employs the plural, thus giving the impression that there have been several manifestations or varied forms of partiality practiced in the community. The passage presents two persons entering “your synagogue.” When the two people enter, one is seated well and the other relegated to standing or sitting on the floor or perhaps. Clearly the two people are strangers, at least to this type of meeting, otherwise they would not need to be directed to their place. It would seem that the most ideal key toward an understanding of the situation of this illustration lies in the use of the word synagogue. This perhaps points that the assembly is a judicial assembly of the church and both litigants are strangers to the process. The usage of the word synagogue and its attached identification to Jewish religious gatherings opens up possibilities that perhaps the story of the two men that James mentioned in the passage is not an actual event. As there are those who contend that the case mentioned in 2:2-4 was one that James merely heard about –an incident in a Jewish synagogue that believers from Israel still visited. There seems to be a strong argument was hypothetical. Those who postulate this diatribe style theory like Dibelius argue that because the illustration is not based on an actual incident, consideration of the community or the social situation out of which it grew is irrelevant. This of course is a logical stance for those who see that they are working with the assumption that James “spiritualizes” the rich and poor. In other words, because it seems quite evident that the illustration here refers to literal economics and class distinction, it is necessary for scholars to suggest that the case is a “constructed” illustration. However, if these verses were merely a paranaetic example without any concern for reality, a pertinent question would be: “How effective would this example be if it were completely unrelated to the experience of its readers?” Moreover, if this is not an actual event –why is there a constant use of the word ‘brothers’ if not for the obvious reason that the author knows his audience and that this audience is faced with a particular problem? But regardless, of which stance one takes verses 2-3 provide a clear example of partiality: the rich man is honoured, the poor dishonoured. Persons who are seated or shown special prominent seats are commonly superior to others in antiquity. Those told to stand or sit by someone’s feet are of lower status or even captives, while the word synagogue has usually been understood as a gathering of the community for worship. Thus although the social setting may seem exotic, the dynamics of the scene are instantaneously recognizable: James sketches human behaviour that is virtually universal. The rich and powerful are the ones who can benefit us, and the favour shown them, it is assumed, will come back to us. No great grasp of cultural comparisons is required to make this example come alive: it is enacted daily in countless ways. Reflecting on verses 2-4 reminded me of a conversation I once had with my mother while we were passing by a Catholic church and we saw a poster of the proper attire for people to wear at church, and my mother remarked that in spite of such signage people still whatever they feel like wearing to church, to which I remarked that in the same manner the church is bound by obligation as Christ’s visible presence as a community of faith to not refuse those people in spite of their attire. In the same manner the passage brings into mind familiar stories of people within a household who give special treatment to their rich relatives more than their poor relatives (reminiscent of the TV sitcom John en Marsha). It is tragic to think that such partiality happens even in the household of God, the community of faith: the church. That perhaps is the reason why after his account of the two visitors in the assembly James places a reflexive question to his brothers consequently to remind them of their personal shortcomings to quality as ‘just’ judges who will be able to execute justice within the church. John En Marsha was the longest-running and most-watched prime time comedy sitcom in the Philippines during the 1980s that aired on RPN 9. It follows the misadventures of John Purúntong, his wife Marsha, their children Rolly, Shirley, and his pesky and nagging mother-in-law Doña Delilah. The show works on the premise of Marsha marrying the impoverished John Purúntong much to the dismay of her wealthy mother, Doña Delilah, to which ironies that operate around issues such as class distinction between the value systems of the rich and the poor are demonstrated in the dealings of John and Marsha with their differing economic backgrounds. This entry was posted in Biblical Studies, Theology and tagged Epistle of James, Equality, Exegesis, Hermeneutics, orthopraxy by Chuck Baclagon. Bookmark the permalink.